It is with sadness that I have to make note of the death of Lori Presthus, the Portland-based cellist who was a member of the Portland Baroque Orchestra. She passed away on November 20 at age 57. According to this obituary, she had a re-occurrence of cancer. In addition to her expertise with the cello, Presthus excelled in painting and jewelry making. I had the pleasure of interviewing her and writing it up for Oregon Music News. Presthus was a remarkable person, and she will be missed in the Portland community. Congratulations on your contract extension. Does your job pretty different from day to day? That is, do you go into the office in the morning have meetings and then meet with a board member or something like that? Kalmar: My job is very different from a 9 to 5 job. The most routine part of the job is rehearsal with the orchestra. On a day with two rehearsals the first goes from 9:30 to 12:30 and the second from 1:30 to 3:30. Afterwards there may be meetings or dinner with donors, but what is routine about that? Rehearsals are always different. Basically, there is no routine. Now that you’ve been working with the orchestra many years, and many of them know your podium style and might intuit what you want, do they respond faster and better? Kalmar: I would say both. They are very fast. That happened ten days ago when Christian and Tanja Tetzlaff were here for the Brahms Double Concerto. The first thing that I have to mention, though, was that Christian told me that our orchestra is the best one that he had ever played Brahms with, and that included the big name orchestras. He also remarked that this orchestra is insanely fast. The orchestra and I are accustomed to each other and there’s a certain pace that we have. So we can dig into the piece very quickly. You don’t have to spend a huge amount of time on things that ultimately are on the technical side of music making. That was never a big issue here in Portland, but now it’s considerably less important. For the last couple of years, there is no piece in the orchestral repertoire that would make this orchestra blink. That was not the case ten years ago. Certain pieces were a stretch back then. Of course, you always have to push the limits. Now the limits are way up there, and the possibilities of these musicians in this orchestra are astounding. I have to admit that I’ve heard some incredible performances by you and the orchestra. Some of which I thought were better than the recording that I had heard. Like the Britten "War Requiem" that you did. Kalmar: That can happen when and if the performance is good, and when and if the performance is meaningful. Having the visceral presence of you in the room and what this piece does is astonishing. You can’t get that feeling when you are in front of the best technical equipment in the world. The recording that Britten himself did with Dietrich Fischer-Dieskau, Peter Pears, and Galina Vishnevskaya is an amazing recording, but It simply cannot compare to a great live experience. I want, in my own way of reading a score as close to what I think the composer meant. Of course, I always look through my own lens. If someone denies the personality of the interpreter, then he is lying. You do many pieces for the umpteenth time, and other pieces you conduct for the first time ever. How do you make the warhorse sound fresh? Kalmar: When you do a piece for the first time, of course, there is a thrill. You study the piece and learn it for the first time. It’s an exciting thing, and when you do it; it is what it is. Then when I get to do the same piece a second, third, or fourth time, the familiarity allows you to dig deeper into the music. Let’s take the Britten War Requiem. You don’t get the chance to do this piece very often. This was my third time. The first time was a memorable experience, but because I am now more familiar with the work, I think that this latest performance was way better, because of my experience with the piece. But let’s take a piece that I’ve done more than three times, like a Tchaikovsky symphony that I’ve done twenty five times. On one side, the familiarity helps you greatly, but on the other side, it’s a danger. What has to happen and what you have to be aware of is to look at the piece as if you were doing it for the first time. Actually, this issue is coming up for me with the piece that I have done the most in my life, Beethoven’s 9th. I’ll be conducting it five times with the Seattle Symphony at the end of December and the beginning of January, and two times with my orchestra here in Portland. This will be the first time to do Beethoven’s 9th at the end of the year in Portland. We will see if it will become a Portland tradition. The first half will have a cavalcade of stars: Thomas Lauderdale, China Forbes, Storm Large, the von Trapps Gus van Sant, and the second half will have the Beethoven. The great thing about Beethoven’s 9th, is that is one of those pieces where you can always discover things that you’ve never heard before, and you try to bring them to life. Did you decide to record the Haydn symphonies because the string section is so very good? Kalmar: After we had such success with our first recording, “Music for a Time of War” and we were preparing the second recording,” This England,” we talked to the head artistic person at Pentatone – we met at the airport in Chicago – it was very funny because we were coming from three different places. I came from Portland. The Soundmirror guys came from Boston, and Job Maarse came from Amsterdam. He was on his way to San Francisco. So we took time in Chicago to talk. I talk about I would like to record, and the recording company tells me what they can do. They might say, “Well, we just did this.” I presented the American CD that we will be finishing in January with Copland’s Third Symphony. We are retouching that one because it is an extremely difficult piece. That CD will include Walter Piston’s “The Incredible Flutist” and George Antheil’s “Jazz Symphony.” I also mentioned Joseph Haydn. They immediately replied that they thought I could do something interesting with Joseph Haydn. So that’s how the Haydn recording came about. You have performed a lot of new works by Aaron J. Kernis, Thomas Adès , James MacMillian, John Adams, Narong Prangcharoen, and others. What new composers are you looking forward to perform? Kalmar: I am very happy to have done works by those composers and others like Andrew Norman, Tomas Svoboda, Robert Kyr, and I’m hoping to do a piece by David Schiff – probably not next season but soon afterwards. I am always looking at new works. It’s a matter of cost and the necessity of selling tickets. It’s easier for me to program new pieces with the Grant Park Orchestra because of the funding there. Do you own a whole bunch of conductor’s scores? But if you don’t have the conductor’s score, you can always rely on the orchestra’s library? Kalmar: Yes. And having access to three orchestral libraries is an enormous advantage. I’m very fortunate in that regard. What was the very first piece that you ever conducted? Kalmar: Schubert’s 3rd. I conducted it without any training at all. I had played in orchestras as a violinist since I was 12 years old. Everything I knew was by observation. So when I went to the podium and started conducting, nothing went wrong. It must have been a great feeling. Kalmar: It was great. But with conducting, like everything else in life, even when you have some talent, some things go well, but sometimes things fail. And it is likely that thing fail way more often when you are young. So, I did my fair share of failures, and it’s not easy to recover from failures. But in the long run, the failures are important, because failure lets you learn something. You might be angry at first that something didn’t go the way you thought it would. Then you have to learn what you can do to make it better. I’m still learning. I may be quicker in figuring out what I can do to help. You seem to be comfortable in every genre of symphonic music: from Baroque to the newest, most contemporary work. And it doesn’t matter if you are conducting an American piece, an English piece, a German piece, a French piece. How do you do that? Kalmar: I think that I can do this because of two things: first, my absolute refusal to be labeled. Even more than 20 years ago, I didn’t like the idea of becoming identified with one genre. And at that time, my repertoire was a tenth of what it is now. Secondly, I think that you have to curious. Be curious as a musician. And that’s how I’ve built, over many years, an enormous repertoire. I think that I’ll be guest conducting with an orchestra next year where they are asking me to do a new piece. Why not? It’s exciting to me to learn something new. It broadens my horizons. You’re always listed as one of the top monetary donors to the Oregon Symphony. Since the musicians have had to take a big pay cut, have you upped your donations? 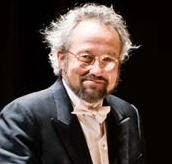 Kalmar: I do my donations voluntarily, and I’ve always very silent about my donations, but I would be very surprised if there were another music director in America who donates as much. Every week that I conduct, I donate a portion to the Oregon Symphony. The truth is, as silly as it sounds, I don’t know how much it is. As a music director, I’m being paid accordingly. I am in the medium range of salaries of music directors for orchestras this size. I’m not sure how much I donated last year, but I think that it was around $44,000. This year it may be more money. I have more engagements. The Beethoven Ninths that I am doing here are donations. I am not collecting a fee to conduct those concerts. My orchestra is in a bad financial situation. It’s important for the orchestra’s key donors to realize that my wife and I donate this type of money, which, for us, is not little. I also feel that my acceptance of the renewal of my contract is a commitment to Portland. Of course, since your name is listed with the violinist Raffaela Wahby in the donor’s page, I guessing that you got married. Did that happen last summer? Kalmar: It was in May. The Portland Symphonic Choir served up large helpings of sonic warmth at its Wintersong! concert on Saturday evening (December 14) at St. Mary’s Cathedral. Embracing the holiday music of many cultures, the choir’s program offered a sumptuous spread of choral pieces from all over the globe and, to top that off, many of its members wore ethnically-garnished dress. Guest songwriter, pianist, and vocalist Naomi LaViolette started the concert with her gorgeous arrangement of Noel. After introducing the melody while playing the piano, the 100-plus members of the choir seamlessly slipped into the stream of music and gradually split it into parts. With a generous burst of volume the piece reached a glorious climax with the words “Noel, born is the king of Israel.” That was a wonderful opener, and it would be interesting to hear another collaboration between LaViolette and the choir in the near future. Under Zopfi, the choir sang two arrangements by Elliot Levine. “Al Hanisim,” invoked Hanukkah, and featured underlying repetitive line that the choir propelled faster and faster so that the prayerful text became more urgent and real. The second piece “Lo V’chayil” (“Not by might”) used a much slower tempo and tones in a lower range to create a serious and affirmative mood. Soprano Carley Kassab and tenor Brian Haskins distinguished themselves with exposed solos near the end of the piece. Zopfi also led the choir in spirited performance of “Gloria A Dios” (“Glory to God”) by Michael Mendoza, who, in addition to his composing activities, is the Director of Choral Activities at The College of New Jersey. Gloria A Dios” is a brief piece in five sections for choir, soloists, and a small chamber ensemble, and the music is joyful and almost bouncy at times. Tenor David Foley sang with terrific presence in the quartet that included excellent contributions from soprano Gail D’Aloiso, mezzo Rachel Portnoy-Bradley, and bass Jim Imhoff. Guided by Kathryn Lehmann, the choir delivered Paul Christiansen’s lively arrangement of “Jeg er saa glad” (“I am so glad”) with élan. The verses in which the women delved into embellishments while the men sang the melody evoked the image of ice skating on a Scandinavian lake. The singing of “Lo How a Rose E’er Blooming, in a setting that Swedish composer Jan Sandström based on music by Michael Praetorius , went in the opposite direction, using humming and closely related notes to create a thick, foggy carpet of sound from which emerged the glowing melodic line. Lehmann also conducted the choir in “The Seven Joys of Chirstmas” by Kirke Mechem, which included a medley of familiar carols from England, France, Germany, and Spain, plus a New Year Song from Japan. The music was beautiful, but the text got a bit muddied, and “Fum, fum, fum!” could have used a faster tempo. Denise Fujikawa provided outstanding accompaniment on the harp. As part of the Wintersong tradition, the Portland Symphonic Choir invites a Portland metro high school choir to participate in the concert. This year’s invitee was the Grant High School Royal Blues, a 32-voice chamber ensemble that has maintained a high standard over many years as one of Oregon’s best high school. Under its new director, John Eisemann, the ensemble sounded very good, giving lovely performances of “Shchedrik” (the Ukrainian carol of the bells), “Wexford Carol” (an Irish carol), “Ukuthula,” (traditional South African song), and “I am But a Small Voice” (by Roger Whittaker in a arrangement by John Coates Jr.), which included hand gestures that symbolized the text. Interspersed with the featured pieces were four carols: “O come All Ye Faithful,” “Hark! The Hearld Angels Sing,” “Joy to the World,” and “Silent Night.” Members of the audience were encouraged to sing along, and they got a terrific jump start by members of the choir, who surrounded them for the first couple of verses of each selection. The concert ended with the PSC and the Royal Blues singing the “Hallelujah” form Handel’s “Messiah,” a sure fire way to get everyone up and applauding with smiles before heading out into the chilly December air. 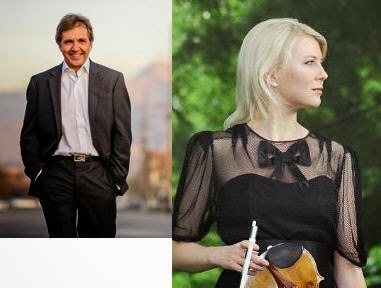 The Oregon Symphony combined with Swiss conductor Thierry Fischer and Finnish violinist Elina Vähälä to give an exceptional concert of works by Sergei Prokofiev, Magnus Lindberg, and Pyotr Llyich Tchaikovsky at the Arlene Schnitzer Concert Hall on Monday, December 9th. Fischer, who conducts the Utah Symphony made an excellent debut with the orchestra, and Vähälä, in this return engagement, again impressed everyone with her impeccable artistry – this time with a piece that was probably brand new to everyone in the audience. Magnus Lindberg is a Finnish composer might be confused with Christian Lindberg the Swedish trombonist/composer/conductor. Besides having the same last name, both were born in 1958 with Christian being four months older. We can at least rest assured that neither composer will be mixed up with former Portland City Commissioner Mike Lindberg. Using a chamber ensemble of strings, two oboes, two bassoon, and two horns, Lindberg’s Violin Concerto has an intimate atmosphere, but demands the utmost intensity from all performers. Another unusual aspect of this work, written in 2006, is that it is divided into three movements that are denoted with time signatures rather than the titles like adagio and scherzo. This concert marked Vähälä’s fourth appearance with the Oregon Symphony. She performed Vivaldi’s “The Four Seasons” in 2007 (reviewed here) , Britten’s Violin Concerto in 2010 (reviewed here), and Prokofiev’s Second Violin Concerto in 2011 (reviewed here). With Lindberg’s Violin Concerto, Vähälä again brought great intensity and technique. She executed numerous, very fast downward and upward scales that were imbued with little glissando-like effects. The clear, crystalline tones that she elicited from the upper register of her violin took the audience into a soundscape that went back and forth from serene to agitated. Here and there she would engage in a conversation with the orchestra, as if to inspire or cajole them along the way. Vähälä’s performance was supported by an orchestra that was equally engaged. It seemed that at one point the bass violin section had to play at the top of their registers, and the end of the piece did end in a scherzo-like fashion with everyone on stage playing at hyper speed. The audience became so caught up in the performance that you could have heard a pin drop. Overall, Lindberg’s Violin Concerto is an impressive piece, and time will tell if it enters the standard repertoire. The concert opened with a scintillating performance of the Symphonic Suite from Prokofiev’s opera “The Love for Three Oranges.” The orchestra, under the magic of Fischer’s baton, created all sorts of sonic colors that changed from fanfare-like swirls to delicate layers of sound followed by sudden bursts and rumbling that crashed together – and that was just in the first selection, entitled “The Ridiculous One.” You didn’t need to know the story of the opera or the names of the movements to be entertained by this work. Snarling trumpets and trombones, liquid smooth woodwinds, pummeling timpani, exciting decrescendos and crescendos , wild accelerandos, and virtuosic ensemble playing by the entire ensemble combined to make the Symphonic Suite mesmerizing. For second half of the concert, the orchestra gave a stellar performance of Tchaikovsky’s Fourth Symphony. Even though each member of the orchestra has probably played this piece a hundred times, Fischer seemed to find a way to engage them and the piece sounded absolutely fresh. The tempos never dragged and the very full-Russian chords didn’t have any heaviness. Even though Fischer never pointed much at various sections or principals of the ensemble when it was their time to shine, he still elicited incredible performances from everyone. Highlights included the super smooth and sweet sound from principal bassoonist Evan Kuhlmann, the pillowy soft touch that principal timpanist Jonathan Greeney applied, principal clarinetist Yoshinori Nakao’s liquid and languid phrases, and the sparkling piccolo of Zachariah Galatis. There must have been something extra special going on between the orchestra and Fischer, because concertmaster Sarah Kwak refused to get up when Fischer came out for the second round of applause, allowing Fischer to receive the applause all by himself. He, or course, continued and finally succeeded in getting Kwak (and the orchestra) to stand, but this was a terrific thing to see, and I have to admit that I’ve never seen it before at an Oregon Symphony. I have only seen this one time, and that was when Gustavo Dudamel conducted the Israeli Philharmonic in, yes, Tchaikovsky’s 4th at Carnegie Hall in 2008 reviewed here.) That puts Fischer in good company. Postscript: In his introductory comments to the concert, principal percussionist Niel DePonte mentioned that there are 193 cymbal crashes (all in the 4th movement) of the Tchaikovsky. During the performance, I started to count them and got to 114 before DePonte began crashing them (little crashes) so fast that I could keep up. He has remarkable hand and wrist strength - much like a professional athlete. The Minnesota Orchestra was nominated to the best orchestral recording category for the 2014 Grammys.